Beginning in January, the Notre Dame Institute for Global Investing partnered with Notre Dame Studios and the new Rex and Alice A. Martin Media Center as part of its Sorin Storytellers program. The Sorin Storytellers is the communications arm of NDIGI, where students looking to have meaningful, skill-building experiences have the opportunity to intern. This experiential learning opportunity is comprised of American Studies majors, who are writing interns, Graphic and Industrial Design majors, who are graphic designers, Computing and Digital Technology students, who focus on technology development, and Film, Television, and Theatre (FTT) students, who focus on video production. All of these interns work together in different ways to tell the stories of NDIGI. Unlike the other teams, the FTT interns are unique because they are a part of ND Studios. Interns Winnie Mang’eni, Zachary Lawson, Jacqueline Marino, and Victoria Fabio, who are all majors in the FTT department, work with ND Studios and assist NDIGI in its content creation. During the spring 2018 semester, these four interns have worked on five videos for NDIGI, on topics ranging from NDIGI’s Venture Fundamentals workshop to the Annual Review. The video projects require the interns to take previously shot footage and edit it to tell a story in a new, creative way that is distinguishable from news articles or social media posts that the Institute has produced. The interns also have the opportunity to produce and shoot new video footage, which they did when interviewing students participating in the NDIGI Corby Capital program on their recent project creating a Confidential Information Memorandum for DARI Motion. Beyond the FTT interns, the ND Studios partnership has provided an opportunity for the students involved in NDIGI’s Corby Capital programs to practice their communications skills, as they discussed their projects for NDIGI videos. Presenting under the spotlight of a camera in a professional studio is a very different experience from presenting in front of a class or interviewing with a potential employer. 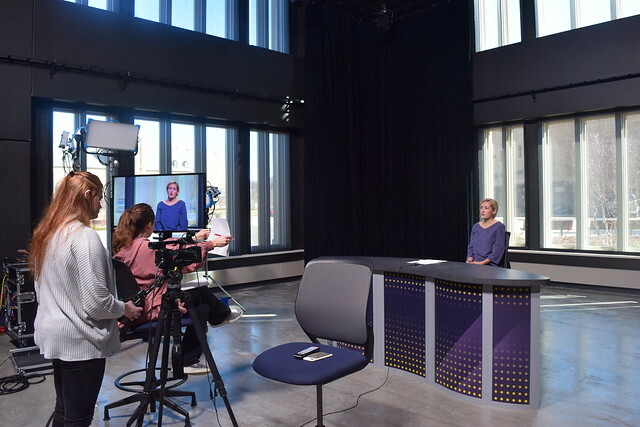 While the Corby Capital students were initially nervous to speak in front of the camera, they also realized the importance of broadening their communication and presentation skills to include digital media. The partnership with ND Studios has also benefited the other Sorin Storytellers. The graphic design and writing interns were stretched in new ways because the partnership allowed them to think about how storytelling is done across multiple platforms. Usually, the interns create content online or for printed materials, but the partnership with ND Studios meant that the interns had to think about storytelling through video production. The ND Studios partnership has provided NDIGI with an invaluable opportunity to expand its presence through different forms of media. The partnership not only benefits Institute communications, but also NDIGI students and interns. By expanding its network across Notre Dame’s campus, NDIGI continues its mission of becoming the preeminent university-based investment management research and education program in the world.